Has your memory of East Coast winter faded already? Perhaps not yet for residents of Syracuse, New York (along with Rochester and Buffalo to the west) whose home towns regularly find their way onto various lists of the "top 10 snowiest cities." Jenkintown Borough was incorporated on December 8, 1874, from 248 acres of land taken from Abington Township; however "Jenkins Town" was a recognizable village within the Township for many years prior to its incorporation. Last year, Money Magazine published a piece titled Best Place to Live in Every State. Cited for Pennsylvania was Lower Merion, located along the Philadelphia Main Line. Lower Merion home to the second oldest Friends Meeting in the US and the Pennsylvania Railroad's circa 1914 Merion Station. Chattanooga, TN, Detroit, MI, Cincinnati, OH, Seattle, WA, Cambridge, MA and Phoenix, AZ are six case studies covered in a Brookings Institute report issued last Spring. Catalytic development: (Re)creating walkable urban places. "Since the mid-1990s, demographic and economic shifts have fundamentally changed markets and locations for real estate development. These changes are largely powered by growth of the knowledge economy, which, since the turn of the 21st century, has begun moving out of suburban office parks and into more walkable mixed-use places in an effort to attract and retain highly educated young workers and support creative collaboration among them." According to the National Association of Realtors, Baby Boomers currently are the second-largest generation (after millenials) of home buyers (32%). Living Places is curating a list of Boomer‑friendly active adult (55‑plus) communities which you can view HERE. Bordering Fox Hollow is the Valley Glenn neighborhood—a residential subdivision of 60 detached, single family homes built circa 1986-1987. Enos Park is a historic, 19th century streetcar suburb in Springfield, Illinois. Belmont Ridge is a residential subdivision of approximately 125 detached single family homes in Bensalem, Bucks County built circa 2005-2006 by Realen Homes. Sunny Knolls, Residential Subdivision of approximately 50 detached singles in Lower Makefield, Bucks County. There are currently 2 Homes For Sale in the the neighborhood, a 4 bedroom and a 5 bedroom, both are single level ranches on Sunnyside Drive. Reisterstown, Maryland — When John Reister, a German immigrant, acquired 20 acres of land just north of Cockeyes Mill Road from the Calvert family in 1758, he named the tract Reister's Desire. The settlement that developed was largely made up of Reister's children and their families. In 1768 a nearby piece of land was purchased by Daniel Bower, also of German descent, whose children joined those of John Reister. Crabtree Hollow is one of the 40 Levittown subdivisions of detached, single family homes (more than 17,000) built by William Levitt during the 1950s. Morgan Hill is a residential subdivision of 26 luxury townhomes built around 2004 in Doylestown, Bucks County by the Elliott Building Group. The Oakenshawe Historic District is significant for its association with the urban development of Baltimore at the beginning of the 20th century, and as an example of a type of residential subdivision which characterized the area in the period. 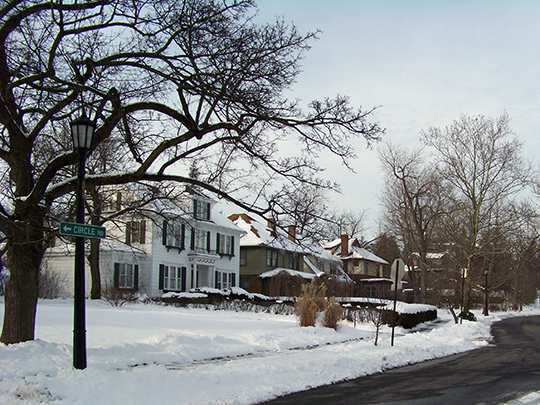 The District is distinctive among the early subdivisions of north Baltimore for its consistent architectural character. Southampton Township is approximately 43 square miles in size and can be characterized by its expansive farmland and open space surrounding a historic village center. Approximately 75% of the Township's land is located in the Pinelands Preserve. [Burlington County, NJ]. Nether Providence Township was formally established in 1687, and lies in the southwestern Philadelphia suburbs. It is a classic bedroom community in an area covering approximately five square miles. With a highly residential and wooded character, the Township is punctuated by schools, churches, recreational and cultural facilities, along with modest commercial activity. [Delaware County, PA]. Just Listed in Lower Milford Township — 4 bedroom, 1-1/2 bath Cape on a 1.2 acre lot on Church View Road. [Lehigh County, PA]. Providence is a residential subdivision of detached, single family homes built circa 2001‑2002 by T.H. Properties. [West Rockhill Township, Bucks County, PA]. Westover Woods single family homes built primarily during the 1950s, 60s and 70s. [West Norriton Township, Montgomery County, PA]. Wynne Field Estates is a residential subdivision of 28 single family homes by builder John Garis, circa, 2006. [New Hilltown Township, Bucks County, PA]. Tower Hill Meadows Colonial Sold in 1 Day by The Melissa Healy Group. [New Britain Township, Bucks County, PA]. Circa late 1800s brick Victorian Just Listed For Sale by The Melissa Healy Group — the 1884 Thomas W. Trego House, winner of the 2017 Stewardship Award from Doylestown Borough. [Bucks County, PA]. Slide Presentation: Homes in the Carriage Hill neighborhood. [Plumstead Township, Bucks County, PA]. Slide Presentation: Homes in Yardley Run neighborhood, Lower Makefield, Bucks County. There ar 6 residential zoning district designations in the township. The name Towamencin is of American Indian origin, and means "Poplar Tree." However, a legend associated with the name started in the 1720's when Heinrich Fry purchased some land near what is now known as the Towamencin Creek. On this tract of land was an Indian Village. The Indian Chief spoke broken English and one day observed two men clearing trees near the creek and said "Towha-men-seen", meaning "Two men seen." Apparently, the Chief's pronunciation stuck, as the legend goes, and is how Towamencin got its name. The Edward Morgan House is an excellent example of a medieval European log house. Many features, such as the basic center chimney plan, asymmetrical window and door placement, pent roof, diagonal chinking, and casement windows, give evidence of the medieval influence in building techniques. The house is remarkably well-preserved and has exceptionally fine interiors for such an early, rural dwelling. Active Adult (55-plus) townhome for sale by Debra Granite, Keller Williams Real Estate, Doylestown. Located in Delancey Court Price has been reduced to $739,000. 3 bedrooms, 3 baths, 3,300 sq. ft. end unit. Bells Corner is a small, 1 1/4 square mile, well-established neighborhood of cozy, competitively price homes located in Philadelphia's far northeast section bordering Pennypack Park. Forest Ridge is a residential subdivision of single family homes built primarily in the 1990s in Rockland Township, Berks County, PA. Bucks County Natural Areas and Conservation Landscapes — Conservation landscapes emerged as high priority areas for continuedconservation and preservation efforts and in many cases, overlap with State, County and Municipal open space, private conservation lands, and potential greenway corridors. 243 Valley Drive, Yardley, PA 19067, ca. 1964, 1/2 acre, 2 full/2 half baths, 2,300+ sq. ft. $425,000. Marshallton Walk new carriage homes by Lennar Corporation in West Bradford Township, Chester County. Sprawling Ranch in Langhorne Gardens sold by the John McClintock Team for $414,000. Dowlin Forge Station (East Brandywine Township, Chester County) is a residential subdivision of townhomes and singles by D.R. Horton built beginning in late 2017. Marple Township located in the north-central part of eastern Delaware County, is a comparatively mature suburban community exhibiting a wide range of land uses and development intensities. Sadsbury Park (Sadsbury Township, Chester County) is a residential subdivision of townhomes and singles by Keystone Homes and Ryan Homes constructed beginning in 2013. Four bedroom, three and one-half bath colonial in Northampton Crossing (Northampton Township, Bucks County) Sold by The Melissa Healy Group. Townhome in Carriage Hill (Plumstead Townhsip, Bucks County) Just Sold by The Melissa Healy Group. Open House, Sunday, 9/30, 1:00pm‑3:00pm, 2229 Blackhorse Drive, Warrington, PA 18976 (Palomino Farms). Listed by the The Melissa Healy Group. Just Listed For Sale in Big Oak Crossing by the John McClintock Team; 3 Bedroom, End Unit Townhome for $429,900. The Isaac Newtown Hagan House is a nationally significant work of American architect Frank Lloyd Wright, and one of only two such works in western Pennsylvania. While Wright designed many houses during his prolific career, only a few high‑end, more customized examples based upon the Usonian model exist. Contemporary Home Just Sold in Bryn Gweled Homesteads. Open House, Sunday, 9/23, 1:00pm‑3:00pm, 521 Viscount Drive, Yardley, PA 19067 (Edgewood Park). Listed by the John McClintock Team.